At first I thought this was some kind of wacky winter kimono from prehistoric, pre-Patagonia days, but no: it’s actually a futon built for two! 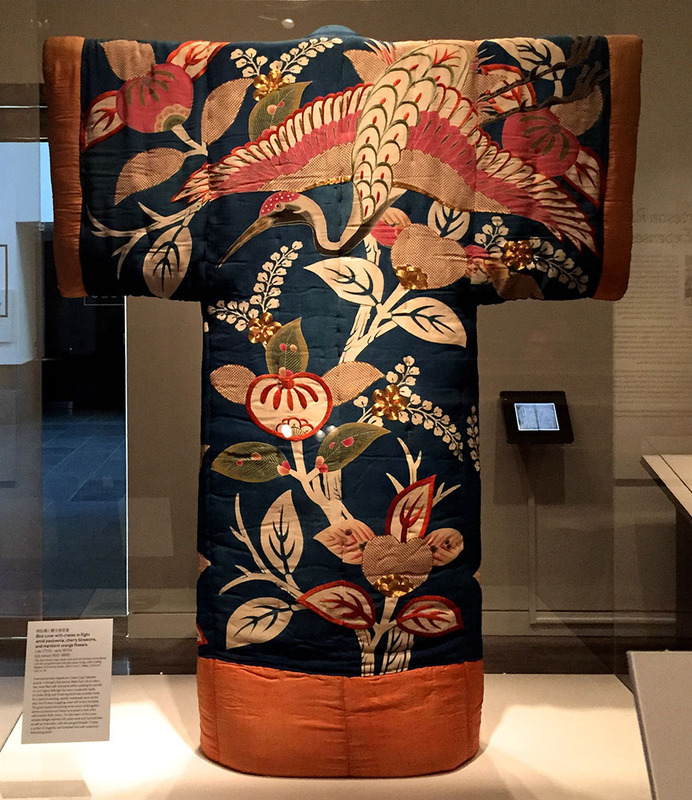 This fancy sleeping bag was actually used by courtesans when they entertained their customers in Yoshiwara! The Sleeping Bag Of Yore in action! Back in the day, plenty of men wealthy enough to buy opulent mummy bags for their paramours frequented the pleasure quarters, even though it was illegal for a samurai to pass the gates. Naturally, this didn’t stop anyone, they just wore special hats designed to cover their faces so they wouldn’t be recognized. The old joke goes that if there was a fire at the bathhouse, the customers would run outside hiding their faces, not their dangly bits! The clever hat disguise did not quite manage to hide a samurai’s swords and pants-challenged attendant. 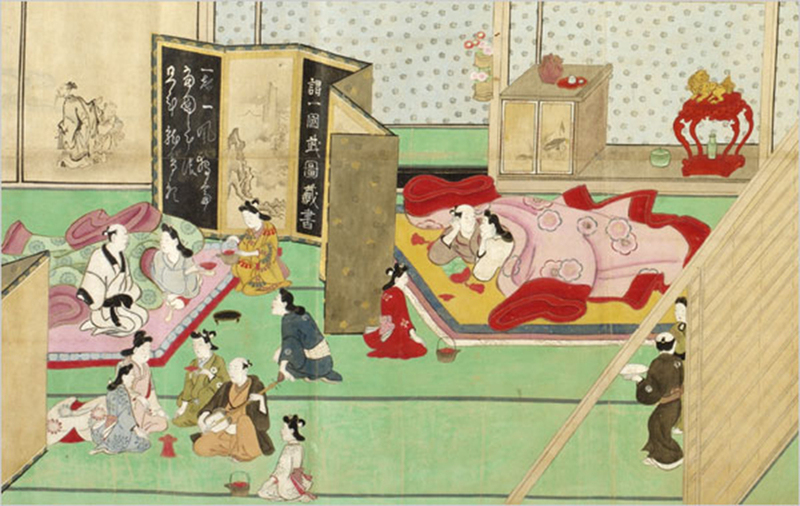 And if you think visiting a host club is expensive, think again: a night of eating, drinking and making merry with the Yoshiwara beauty of your dreams could set you back over $10,000 in today’s coin! I actually saw this awesome exhibit at the Asian Art Museum in San Francisco – it’s called Seduction, and is on through May 10, 2015. 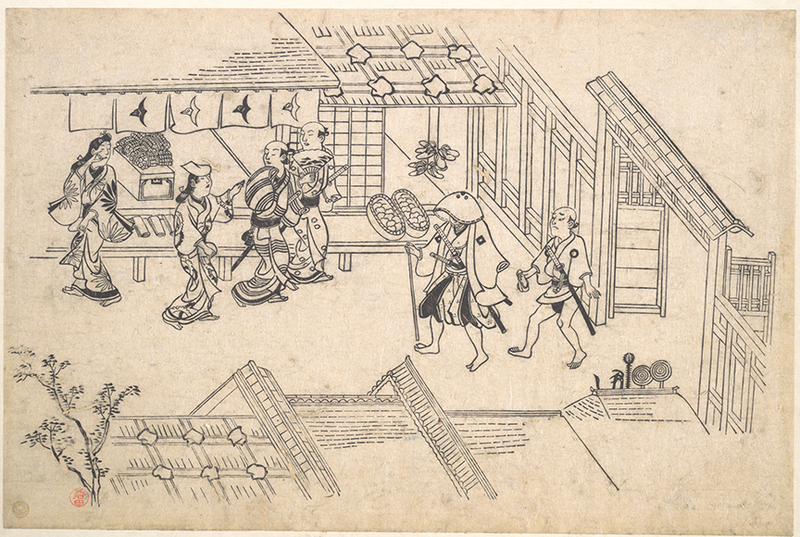 The bottom woodblock print photo thanks to http://ukiyo-e.org/. Both prints are by Hishikawa Moronobu. Love the way you express yourself, my friend. Eda, my friend, you can’t know how much those words cheered me up today. At the moment, my agent is working on finding us a new publisher, and in this phase of Rejection Hell, pretty much all I hear is Sorry But Not Our Cup Of Tea. So thank you for being a very timely break in the clouds! Smile! You’ll find a publisher. I know how easy it is to lose your confidence–don’t give in. Is there anywhere I can buy one of those banner blankets pre-made? I am not exactly a seamstress (seamster?)…. No, sadly, I made this myself with my own little craft craftpern sewing machine, but if you buy a bunch of the banners, I’m sure you can find someone to stitch one together for you back in the States. They’re not expensive, and I can show you where to get them in Kappabashi! This is so very Japanese. Create rigid rules and promise cruel punishments for transgressors but be so lax in enforcement that society finds a way to work around it in the best interests of everyone involved. So utterly unlike the Western way.